Neither a previous medallist in the prestigious multi-sport gathering but they are two most celebrated names, following one outrageous point and one assertion that where there is a will there is a way. On the morning of Thursday 8th September in the group stage of the Men’s Singles Class 6 event at the Rio 2016 Paralympic Games, Great Britain’s David Wetherill met Egypt’s Ibrahim Hamadtou. In the same phase of the Men’s Singles Class 6 event at the London 2012 Paralympic Games; jet propelled, David Wetherill had flown through the air to execute a forehand top spin against Germany’s Tomasz Kusiak, it won a point that brought a standing ovation. 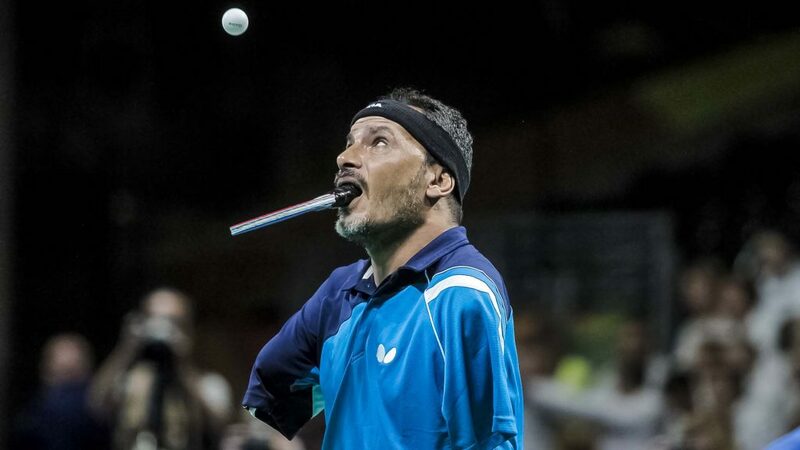 Four years later at the ZEN-NOH 2014 World Team Championships, Ibrahim Hamadtou was the special guest of the International Table Tennis Federation; both arms amputated, he stunned everyone by holding the racket in his mouth. Incredibly he was able to execute top spin rallies with the likes of Jun Mizutani, Vladimir Samsonov and Wang Hao! The verdict in Riocentro Pavilion 3 went in favour of David Wetherill; his greater level of versatility being a telling factor as he made use of the angles to secure a straight games victory (11-5, 11-7, 11-5). Seeking to improve, David Wetherill has also made changes to his style of play. “I have changed from Tenergy on both sides of my racket; now I have short pimples on my backhand”, he explained. Tenergy is a smooth reversed rubber produced by the Butterfly company, ideal for top spin attacking play. “I think I’m now more stable, more solid”, added David Wetherill, who clearly is determined to prove that his more than a flying forehand. It is for 26 year old David Wetherill his third Paralympic Games and just as in London it was special but for a very different reason, for being able to play against a very special human being. Admiration, equally Ibrahim Hamadtou was most respectful of his adversary. There was not a hint of regret or disappointment in the manner of Ibrahim Hamadtou. Moreover, Ibrahim Hamadtou was of the clear view he was better for the experience. “Not all defeats are defeats; sometimes you lose but you actually win because you have added to your experience, you have added to your knowledge; today I added to my knowledge”, concluded Ibrahim Hamadtou.